As slain police officer Baruch Mizrahi was laid to rest in Jerusalem Wednesday, leftist MKs met with PA chief Mahmoud Abbas. Shai led the delegation of MKs in order to discuss what he said were “practical ideas to advance the two state solution,” but Chetboun said that there was a time and place for everything – and Wednesday was not the time for such a meeting. 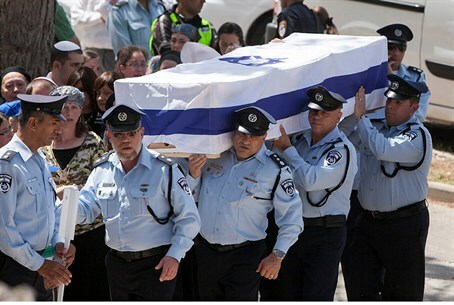 “As we are burying an honored police officer, who left behind him a widow and orphans, you met with terrorists,” Chetboun told Shai in a debate on Channel Ten Thursday. “Your obsession to establish a Palestinian state is making you insane,” he said. “The two state solution has collapsed,” Chetboun said. “It is a horror of a policy whose end is already clear in advance – the 'upgrading' of Palestinian terror gangs into a legitimate army of murderers. The left's vision is bringing us to destruction. It belongs in the wastebin of history,” said Chetboun. The left, however, is not completely at fault; the right had to shoulder its share of responsibility for the situation as well. “For years, the right pointed out only the dangers of the two-state solution, without producing a credible alternative,” he said. “That must end. We must present a viable alternative, which is a single state for all between the Jordan River and the Mediterranean. “And do not threaten us with the so-called 'demographic time bomb,' in which you claim that the Arabs will outnumber us if we make them citizens,” said Chetboun. “Of course adding more Arabs as citizens will present a challenge, but that challenge is better than the danger we would face from a Palestinian state,” he added.